With the piping hot summer we’ve been having (here in the mountains of Western North Carolina, Grandfather Mountain hit an all-time record high of 83 degrees in July and we’ve had upper 80s more than a few times these past few weeks in our neck of the woods), we’re really looking forward to welcoming the crisp coolness of fall, and with it, the sparkly yellows, fiery reds and blazing oranges that envelop our mountains each year. By late September, we’ll see bits of color here and there at the higher elevations, mid- to late October typically brings gorgeous peak fall colors to our elevation at places like Biltmore Estate and the North Carolina Arboretum, and in early November, leaf peepers should still be enjoying a beautiful backdrop of color just south of us at places like Chimney Rock Park. Wondering what times are the best for visiting the North Carolina mountains for fall foliage? We have the details in a blog post we did about this time last year answering lots of questions about fall foliage in the North Carolina mountains. 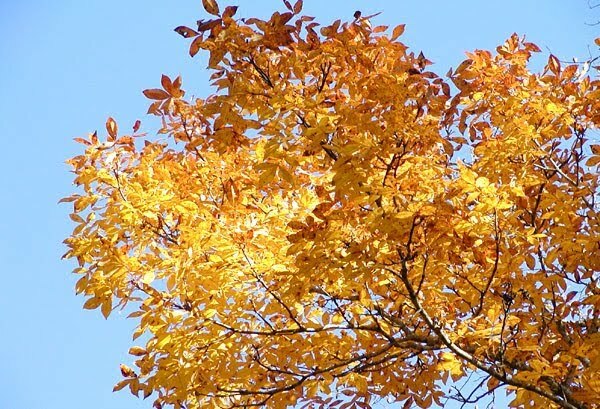 And just as in years’ past, we’ll keep you up to date on what trees are putting on a show and where you can find the fall foliage peak each week with Fall Foliage Reports for our elevation in the NC mountains (2,300 feet above sea level) and beyond. Plus, we’ll also be recommending fantastic fall color viewing opportunities from the highest elevations of the Black Mountains to the foothills nearby. Can you tell, we’re excited about Autumn! This entry was posted in Uncategorized and tagged Asheville, Autumn / fall foliage, Black Mountain by Inn on Mill Creek. Bookmark the permalink.